When the tail is erect for its full length, it is used as a greeting to another cat or to a friendly human and is an invitation for contact rubbing. When a cats tail is vertical in the air with the inevitable question mark, they are happy and relaxed in their environment. This can also be a request for food. 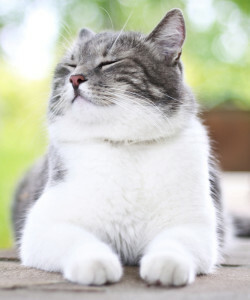 The tail flicks of a seated cat often indicates irritation, they are not sure of whats going to happen next. 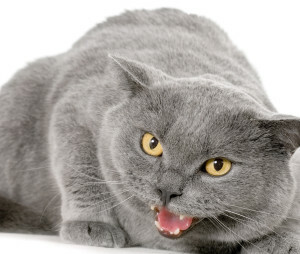 Tail wagging can range from small irritated flicks which may express indecision–wavering between two possible courses of action–or in its most pronounced form, it can be the prelude to a fight between two male cats and undoubtedly accompanied by growling. 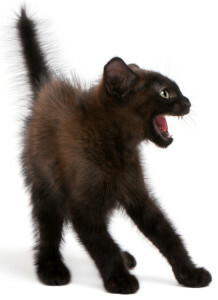 A tail that is held down with an elevated rump belongs to an aggressive cat that is standing sideways near another cat. 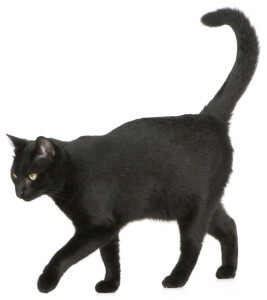 A fluffed-up, arched tail is seen when a cat stands with its back arched (the “Halloween cat”) and it is torn between being aggressive or defensive. A fluffed tail that is positioned straight out or down, is seen when the decision moves toward aggression. (All of these tail positions can be observed when two kittens engage in play fighting.) The tail that is wrapped against the cat’s body may mean that the cat is contented or for a nervous cat, it is a defensive posture. If the tail alone doesn’t give you enough information about what the cat is thinking, take a look at the ears. Cats involved in a standoff will make threatening sounds, but to really understand what is happening, check the ear position. The defender’s ears will lie down flat against the head for protection. The cat whose ears are lying flat, but with a twist, so that the tips of the back of the ear can be seen from the front, is the aggressor. Forward-pointing ears are used by confident, curious, cats to listen for sounds in front of them. A cat that is hunting prey (or playing) will also keep its ears forward to collect as much auditory information as possible in order to execute a successful pounce. In a standoff sit uation the defending cat’s pupils will be dilated to provide the cat with wider peripheral vision, an advantage in anticipating an attack. The aggressor’s pupils narrow to give him better depth perception, an advantage in judging where to attack. While dilated pupils can indicate fear, they are also indicative of the light conditions. In dim light the pupils expand to allow as much light to enter the eye as possible. Perhaps one of the most wonderful of feline body signals, but one that is most often missed by even the most observant of cat owners, is the slow eye blink. According to Roger Tabor, in his interesting and informative book, Cat Behavior, a “Complete Guide to Understanding How Your Cat Works”. 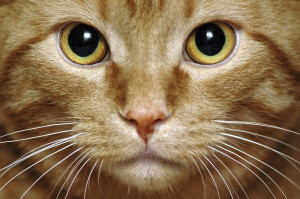 A continuous stare has the opposite effect on cats. It is threatening and unsettling and is used effectively by cats in maintaining territorial distance. This explains why a cat that enters a room of strangers, all of whom are cat lovers except for one, the cat will choose to approach the non-cat lover, the only one who is not staring at him.